My love for pandas is no secret... in fact, it is anything but! Even the kids at school know that I am a panda fan. They have gotten a big kick out of the little panda trinkets I have by my computer... and once in a while, I'll even show off my panda purse... okay, one of my panda purses- I have two! I have other panda treasures- even a new panda necklace- and each little black-eyed token brings me back to a moment in time. These beautiful lumbering animals just stole my heart the first time I ever layed eyes on them... just like the man who introduced me to my very first panda couple. 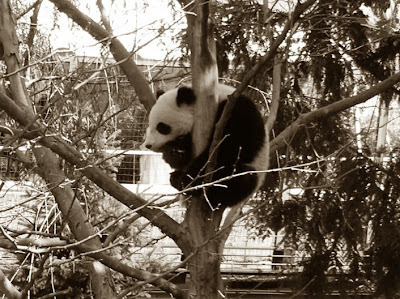 National Zoo, Washington DC... December 31st, 1991... the place and time my life tumbled head over heels with love and commitment. His special place... the pandas... became our special place, when he offered me... forever. I've been hooked on both ever since!